We have many destination specialties other than the Caribbean including Hawaii, Alaska, Costa Rica, Europe, Africa, Mexico, Disney, Iceland, South Pacific just to name a few! DO YOU ONLY BOOK ALL INCLUSIVE VACATIONS? We book all types of vacations including all inclusives, river and ocean cruises, escorted tours, Disney, and around the world sojourns just to name a few. Yes! 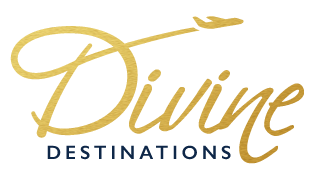 Divine Destinations has clients from all over the world. Communication is key to helping our clients so we are available via phone, email, text messages and even “Whatsapp”. We take all major credit cards and cash. We have an easy and secure payment link which takes credit card payments for all our clients. Prefer to talk to a live person? We can certainly take payment information over the phone or stop by and take care of it in person using cash. We also can set up a payment plan for your convenience. I’M READY TO BOOK MY VACATION! WHAT INFORMATION WILL YOU NEED FROM ME? If you are traveling internationally, we will need to have all travelers names as they appear on your passports and all travelers dates of birth. If you are traveling domestically, we will need all travelers names as they appear on your government ID and all travelers dates of birth. Typically, packages can be held for 24 hours once we have this information. Most packages require a small deposit within that time period. Final payment on most packages is due 45 days prior to travel. However, this is subject to change based on your package details. Yes! While we try to give our clients the best possible prices in our quotes, we can still price match if you find something lower. In most cases we can price match online competitors such as Booking.com or Hotels.com. However, packages must be “apples to apples” to what we are offering. Most online competitors don’t include transfers or hotel taxes/fees. Yes! We do offer travel insurance and highly recommend it to all of our clients. Pricing for our insurance plans are based off the ages of the travelers and the package price. Unfortunately, we do not work with timeshare reservations and advise you proceed with caution if you are considering this as your vacation option. We can assist with flight only reservations. However, please note that there will be a ticketing fee applied to the price of a flight only ticket. Yes! We can buy flight tickets with points or miles on your behalf and of course we can certainly assist with the other components of your vacation if you would want to purchase the flights separately.